Begin your day with an exciting boat ride to the mainland. On our way to Bomba Village we will wind through the Northern River and encounter many plants and indigenous animals. Once at Bomba Village you will have some time to browse the local wood carver’s works and meet the villagers. Wood carving is the village’s main source of income and some of the countries’ most beautiful carvings come from here. 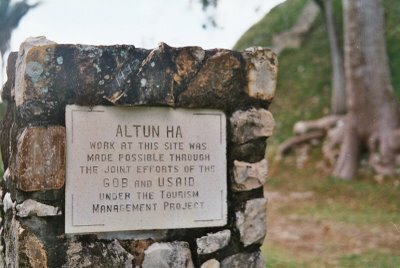 After several minutes of browsing time we will depart for Altun Ha. 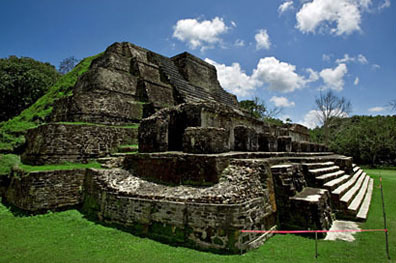 After a short ride in our air conditioned vehicle, you will arrive at the Mayan Ruin site of Altun Ha. We will hike together to the starting point for your guided tour. Once at the site of Altun Ha, your guide will give you an educational tour of the ruins, and after you have worked up an appetite we will head to Maruba Jungle Spa and Resort for an exotic lunch. Maruba Resort & Spa is a beautiful oasis in the center of the Belizean jungle where you can relax and swim by the beautiful pool, or perhaps book a massage or mud bath (for an additional cost). Horseback riding is also available for an additional cost. For visitors interested in bird watching, you will likely see green Aztec Parakeets, Ringed Kingfishers, and Tropical Mocking Birds. By mid-afternoon we will leave Maruba and begin our journey home. Includes: beer, sodas, rum punch, snacks.